How exciting, the first post in this Clap for that Wrap style series! Many of you commented about your interest and trepidation in trying out more head wrap styles for yourselves in the introduction of the series, and I hope as time goes on that we will each learn more about the diverse reasons for head wrapping and scarf styles that will fit our personal aesthetics. For this first post, I'm going to go over some of the types of scarves that are good for head wrapping and the styles they can create. I wear headscarves to work ALL the time, and many people are surprised to find what the actual shape of the scarf is, since it's difficult to tell when it's wrapped. Today I'll show you a few different kinds. Although this is by no means an exhaustive list of head wrapping scarf sizes and shapes available, these are some of the most common, especially when it comes to vintage Western styles. I'll have tutorials for many of these styles in future posts, but this will give you ballpark expectations of what head wrap styles work for which scarves. 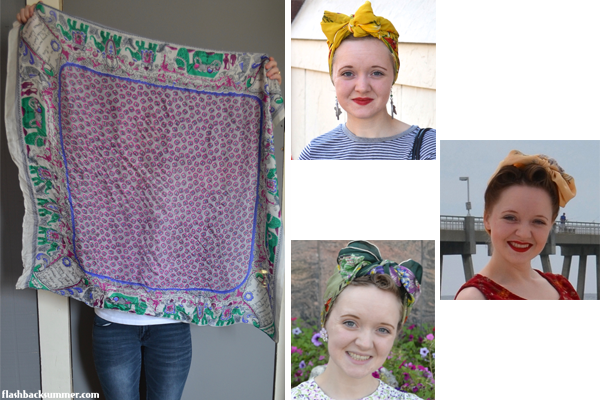 This, it seems, is what most people connect with vintage head wrap styles (think Rosie the Riveter). They're widely available and inexpensive, and they come in a huge variety of colors and patterns. These are a staple for me in my head wrapping, but I use them largely for utility or quick styles, like for cleaning or when I'm short on time. Since they're comparatively small, there's usually just enough fabric to wrap your head and tie a knot, but not enough to do anything fancy like a ginormous bow or flower. This is very similar to the bandana, but they are often larger than a bandana folded in half. They are still usually made of more utility fabrics like cotton. 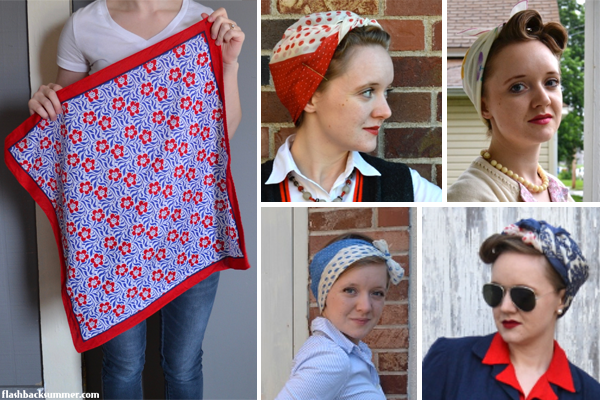 While in vintage days they tended to serve purposes like covering pin curls or protecting hair from dusty work, both the bandana and the triangle scarves can be dressed up with pretty hairstyles like victory rolls and poodle curls. A large square scarf, on the other hand, is useful for a large variety of styles. You can keep it simple and tuck in the ends for a utility look, you can do giant bows. There are lots of styles available with these! A square scarf that measures around 24" or larger works best. While many vintage square scarves can be found, lots of new ones are also sold in Islamic hijab shops. This is the kind of scarf you're most likely to find in modern stores these days. The long, rectangular scarves come in a variety of fabrics, but thinner, lighter ones work best for head wrapping so they aren't too heavy on your head. Scarves with pretty trims or fringe can also add some pizzazz to your wraps. Pashmina scarves are also commonly found in hijab shops. Unlike the scarves commonly found in Western stores, there are also rectangular fabric pieces that are made specifically for head wrapping. They may match the fabric of an outfit, as is common in West African looks, or they may coordinate in color. 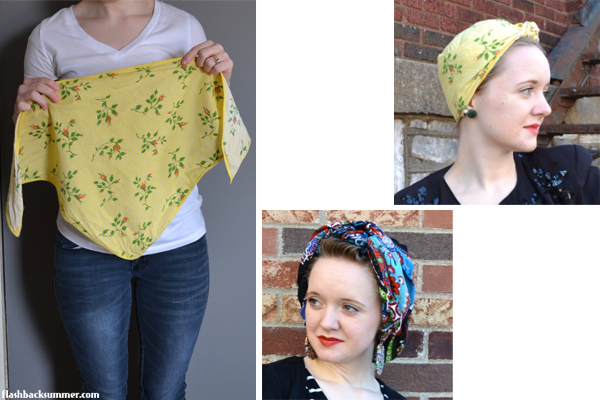 While these fabrics may be stiff and not good for neck scarf wearing, they work brilliantly for head wraps! Sometimes a head wrap isn't really fabric wrapped around the head at all. Sometimes it's actually pre-sewn onto a base or into a certain shape. Many more complicated-looking vintage turbans and wraps are actually pre-sewn and more like hats, so keep that in mind if you're trying to reproduce them. 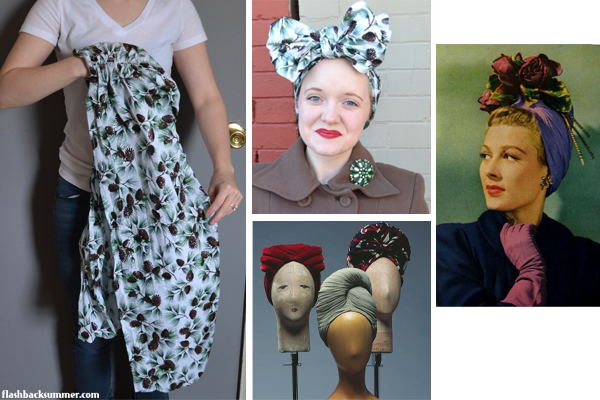 Other headscarves are sewn in some places but still require being tied in other places to look right, like this 1940s duster cap I have on in the picture above. Do you want more head wrap style inspiration throughout the week? 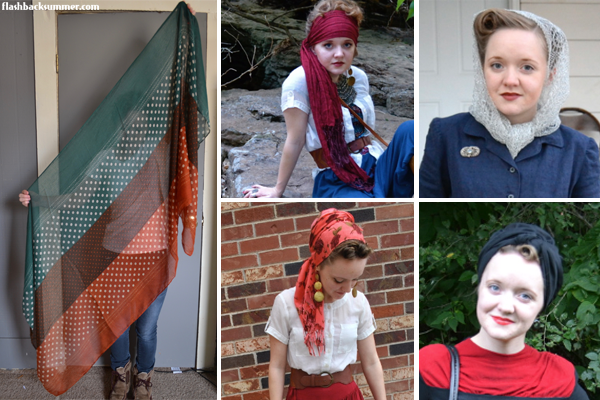 Check out my head wrap Pinterest board! If you're interested in contributing to this series, email me! That's a really good idea! I've found that they work best with really, really thin fabric like silk or something. I loved this post! Would you sometime give a bit of instruction on how to put on the different scarves? I never seem to get it right and at times I really would care for a scarf on the ol' nut! Yep, I'll be doing tutorials for different styles in future posts! Just stay tuned! This is so fun! I rely on scarves so often. It's really fun to play with different shapes and combine several scarves for a more elaborate turban. I can't wait to see your other scarf posts! Wonderful post! I'm a huge scarf fan, too, of all sizes and shapes. For my head, I usually prefer either the large square/bandana style of thin, long (but also fairly wide) ones, which are great for turbans. I wear that same style of scarf a ton as belts (especially with my vintage shirtwaist dresses), so I've built up a nice collection of them over the years. Have a terrific weekend, sweet dear! Ahh Emileigh I'm so glad you are starting with the basics. I've been trying to gently climb on to the head scarf train but it's a bit intimidating. My first lesson was that the square scarves I had were too small to do the fancy styles with. I hope you will show some ways of wrapping for all the different scarf types in detail? Hey Tanith! For some reason, I totally missed this comment; I'm sorry! I will indeed be showing and sharing different tutorials I find! I posted a giant bow tutorial already, so maybe that could get you started until I have more posts! I love this series; you're full of bright ideas! Aw, thanks Dasha! I try, I try!